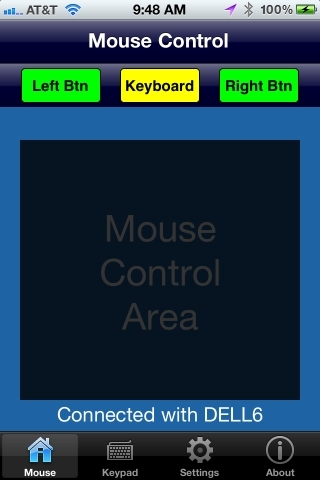 DX iMouse is a app that allows you to turn your iPhone or iPad into a wireless mouse/keyboard to control your PC or Mac. It is most effective for those who use a PC/Mac as the source for their TV viewing for such things as Hulu, Netflix, E-Mail, Web browsing, or other PC/Mac things they want to see on their TV. Use the iOS device visual mouse control area and your finger to move your PC/Mac mouse. Taping at any point generates a left mouse click. You can also use the left/right mouse click buttons at the top to manually generate a mouse click as the current point. A screen example is shown here. Use the Keyboard button at top to show a full keyboard for any text entry as the current mouse location. 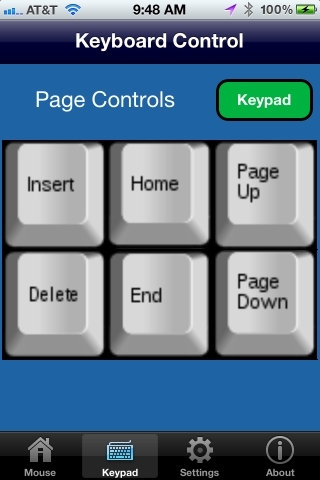 Use the Keypad tab at the bottom to display a variety of keypads for more data/movement control. The iPad version of the app includes these controls automatically at the bottom of the mouse control area. An iPhone screen example is shown here. Settings allow the user to select the PC/Mac to be controlled, the ability to scan their local WiFi network for controllable PCs/Macs. The user can also enable screen timeout, whether click sounds are generated any time a key is pressed, and to select the mouse sensitivity. An iPhone screen example is shown here. See here for more information about DX iMouse software and the server software you download to run on your PC or Apple Mac. 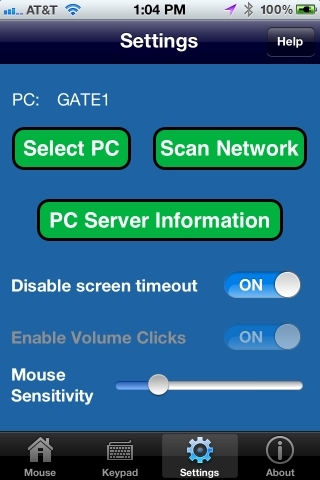 DX iMouse is designed for Apple iOS 5.x and iPhone 3GS, iPad, and later devices and supports Windows based PCs, Apple Mac platforms, and local Wifi networks. DX iMouse also includes a separate software component that runs on your PC to perform various actions. A server version for Apple Mac products is also planned.